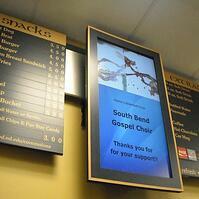 Our indoor digital menu board solution offers you a wide array of screen sizes, computer and wireless content delivery options, and a proprietary content management software program that is easy to learn and utilize. Create your own content, use a third party, or have our designers develop original content using the latest video editing techniques. Is your chain compliant with the FDA mandated food labeling act? Place calorie information on your menu board now; our graphic designers can show you how to best incorporate calorie information on your listings. Need installation? No problem! Our nationwide system of installers will survey your facility to determine cabling and connection needs, and install your new digital menu boards. Look to the Howard Company for the right mix of technology, the right content, the right execution plus the right follow-through to help you make the right decision about switching over to a digital menu board system!